Indoor plants have a way of making any room look vibrant and inviting. Not only do they complement the decor, but they clean the air, increase humidity, produce oxygen, and boost your mood. Studies have also shown that connecting with nature in some form has many physical and mental benefits. In short, plant life contributes to your health and well-being. Here are some suggestions to help you choose plants for the various rooms in your home. Tropical Hibiscus plants add an exotic touch to your sunroom, and come in a variety of dazzling colors. They require six to eight hours a day of direct sunlight for the flowers to fully bloom, although they can grow in a partly shaded location, but bloom less. Tropical hibiscus prefer a closely-fitted container with excellent drainage. In warm weather they need daily watering, but in the winter only when the soil is dry to the touch. Boston Ferns like medium to bright light, but not direct sunlight. They make excellent hanging plants, although they can be placed in pots as well. Boston ferns need extra humidity, so mist them once or twice a week, and keep the soil damp to maintain their beautiful green color. Croton plants come in different colors and leaf shapes. Check the variety you’ve purchased for sunlight requirements. The more brilliant the color, or colors, the more light the plant needs, which makes it perfect for a bright spot in your sunroom. Because it is a tropical plant, it will need regular misting. Water when the top of the soil is dry. Yucca Cane plants have green sword-like leaves that grow on canes, or large woody stems. Over time yucca cane plants can develop into a tree that reaches several feet high. They require medium to bright indirect sunlight. Water when the top inch of soil becomes dry. Mist the leaves to keep the tips from turning brown if the air in your sunroom is extremely dry. Living room houseplants can range in size from those in small pots, to small trees. Choose plants that thrive in low to medium light. In a living room with an eastern or northern exposure, the brightest light of the day won’t last long or may not penetrate very far into the home. Asparagus ferns need low light and do poorly in bright light. They look elegant in hanging pots in front of windows, or spilling gracefully over the side of a standing container. They’re also a fine choice for coffee tables and other large horizontal surfaces. When thriving, asparagus ferns produce small flowers and berries. Snake plants (mother-in-law’s tongue) tolerate any light level from low to bright, although it grows fastest in bright light. They’re very hardy, and can survive low light and drought. NASA research has shown snake plants can even remove toxins from the air, such as formaldehyde and benezene. Rubber trees (Ficus elastica) need indirect light that’s not too hot. Some people recommend putting them by a window with sheer curtains. They need to be kept moist during the growing season, but watered only once or twice a month during the dormant season. Indoors they are commonly kept at a height of 1-8 feet. They grow faster and larger in bigger pots. Dracaenas do well in sunny living rooms. Young plants are small and bushy, making them ideal for tabletops and desks. Older dracaenas develop woody stems and can reach 5 or 6 feet tall, although it takes a while to grow to this height in a living room. The striped-type dracaena have beautiful leaves that look good by themselves, or in combination with other plants. Succulents and Cacti usually prefer bright light, but need some protection from the noon sun. Sunny window sills are ideal for these. Succulent plants have leaves or stems that are filled with juices, and come in different shapes, sizes, textures, and color variations. 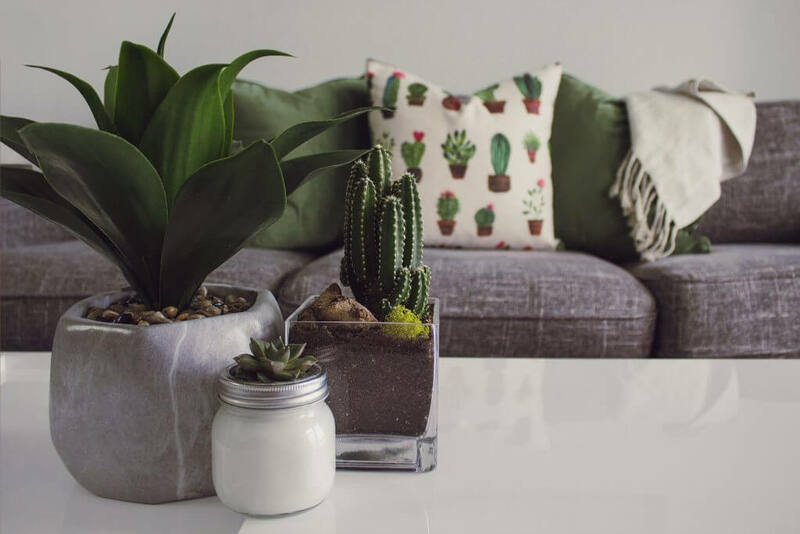 Examples of succulents include: jade plant, aloe vera, echeveria, zebra plant, panda plant, and crown of thorns. Cacti are defined as succulents because of the way they store moisture. But what differentiates cacti and makes them cacti is that they grow areoles (cushioned growing points that are technically compressed branches). Spines, “hair”, and flowers grow from these areoles. Many succulents resemble cacti in every way, except they don’t grow spines. Some of the more common groups of cacti include: Cereus, Echinocactus, Espostoa, Ferocactus, Mammillaria, Notocactus, Opuntia, Parodia, Pilosocereus, and Rebutia. Spider plants grow in low to medium light, require regular watering, and filter formaldehyde from the air. This houseplant is one of the most adaptable of house plants, and the easiest to grow if you don’t have a green thumb. Parlor Palms grow very slowly (up to 3 or 4 feet tall), thrive in low light and cramped spaces, and are great air purifiers, making them excellent bedroom houseplants. They like a little bit of light, so place them by a window that receives some early morning or late afternoon light. Let the soil dry between waterings, and water even less in the winter. Aluminum (Pilea cadierei) plants are generally grown in hanging baskets. They do best in medium light, but also do well in low and brightly lit environments. Let the top inch of soil dry between waterings, and keep the soil a bit too dry rather than a bit too wet. They also love humidity, so if your home is overly dry during the winter mist the leaves every other day with plain water. Inch Plants (Tradescantia zebrina) also called “Wandering Jew” or “Purple heart”, do well in medium or bright light, and most can take a little direct sun on their leaves. The trailing vines make it a perfect choice for hanging baskets. Keep the soil slightly moist, and don’t water the leaves and flowers, as this will cause rot in the plant. These plants don’t age well, and will have to be renewed once a year or so from cuttings. Some houseplants are actually poisonous if ingested. Avoid the following common plants that can harm children and pets: daffodil, hyacinth, dumb cane, Easter lily, English ivy, lily of the valley, oleander, peace lily, philodendron, pothos, sage palm, ZZ plant, and iron-cross begonia. Houseplants add beauty and functionality to your home. When you want to enhance your home with a sunroom addition, call the experts at Sunshine Sunrooms at (972) 243-5390 or fill out our quote request form.